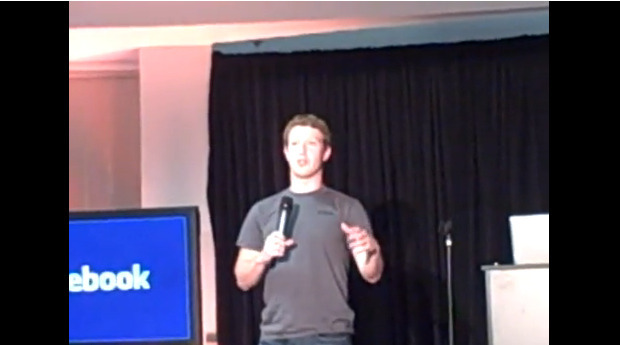 Yesterday, Mark Zuckerberg launched Places, Facebook’s location-based Service. And what a presentation it was. Unashamedly amateur, (although credit should also be given to VentureBeat for its astonishingly indie auteur camerawork) if the Facebook crew wanted to present themselves as endearingly charming students with their head screwed on the right way, then they got it right. There’s something a bit karaoke about it all as well–a pair of medium-sized TV screens flanking the stage, the fetching peach/apricot tone on the walls, the black curtains that you’re just hoping will slide back to reveal dancing girls/a mime rendition of what Places is all about. But instead, what you get is Zuck, complete with a few demi-jokes to show off his comic timing (not bad at all, actually), and some personal details (he was at a Menlo Park restaurant with his girlfriend when he realized that Places was fit for public consumption). Then it’s all “roll the video” and “here’s the team” before he sloped offstage, job done. Now, we all know what a master Steve Jobs is when it comes to showcasing new Apple products. He’s been doing it for a long time now, so it’s not surprising that he’s got the formula down pat. But, before Apple got so glossy it couldn’t stop looking at its own reflection, its presentations were still neat. Here’s Jobs presenting the iPod back in 2001. He’s succinct, you can tell that he practiced the script a whole load of times, the product is presented in a very media-friendly way, hitting the assembled hacks with facts and superlatives. No matter that you can still see the breeze blocks in the wall, that the typeface used is not exactly a classic, it’s well polished. And then let’s look at Google’s launch of Google TV at its I/O conference a couple of months ago. Google’s not exactly known for its successful launches–remember the disastrous Nexus One launch at the beginning of the year? Well, it’s not the first time that Google has fluffed a presentation. This time, however, they’d got the corpo-rave music, the cool-o technical bod behind an Apple laptop, the lights, and then the confident “A-right” from Rishi Chandra, Google TV’s project leader. Something tells me there was coaching involved. Yes, there might have been a bit too many of those hand movements that media coaches insist make your words mean even more than you mean them to mean. Unlike Apple or Google, however, Facebook is not a public company. So they don’t have so many dollars to spend on the presentation lark. Maybe they feel they don’t need it. Facebook is so unashamedly young–it’s CEO is just 26 years old, after all–so it wants to keep a distinctly amateur feel to it. Maybe the firm doesn’t want to piss its investors off by spending money on presentations–why should it, Places is going to be a success anyway–and perhaps the Palo Alto branch of Karaoke Dreams was the only venue free at such short notice. So, how long before Facebook takes the plunge and calls up the experts to add a bit of razzle dazzle to the show? As Zuckerberg said, the firm has got a whole bunch of pressers coming up through Summer, and don’t expect anything to change too much for those. But what do you think? Is it time Facebook and its employees smartened up their act? It is, after all expected to dominate the Internet for the foreseeable future, something that Google, current online behemoth, is very aware of.